“Jeremy skilfully contained our wildly optimistic ambitions but somehow managed to distil the essence of what we wanted, to produce something that has surpassed anything any of the 5 previous garden design teams and our own attempts at design. 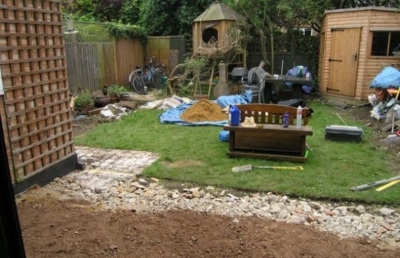 Existing– This small garden was neglected and suffering from the the depredations of a family with three young children. It was in dire need of a re-design to take into account the disparate demands of children, adults and plants. 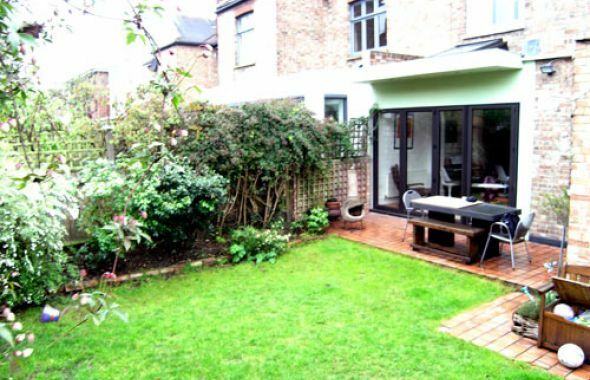 Brief – The clients, a couple with two boys and a daughter, wanted a romantic yet practical garden with room for entertaining and eating outside. 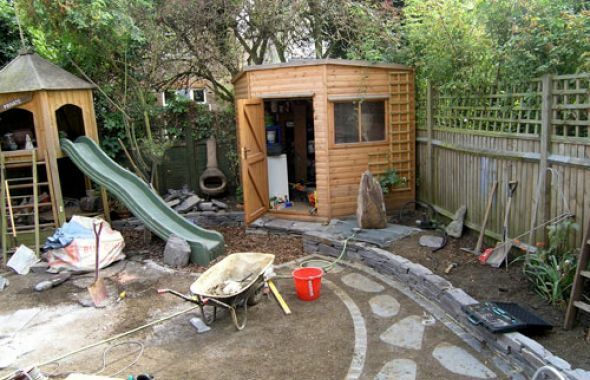 The shed and large play house had to remain and the design had to incorporate space for a football goal, a quuiet seating area, a lawn and plenty of plants. 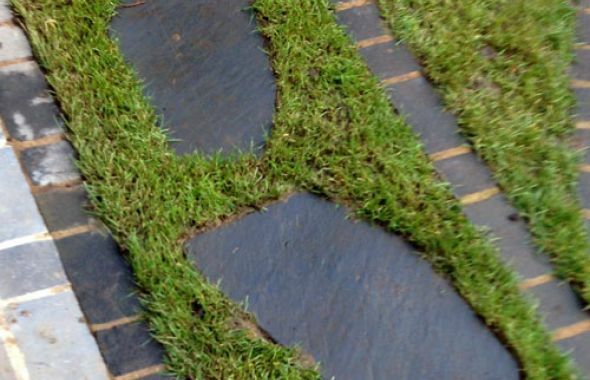 The family have a cottage in the Lake District and wanted to use slate and other natural stone. 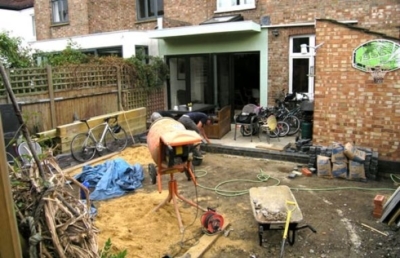 Solution – This was a difficult project, the problem being to fit so many apparently disparate elements into a relatively small space, while creating a cohesive, attractive and functional whole. 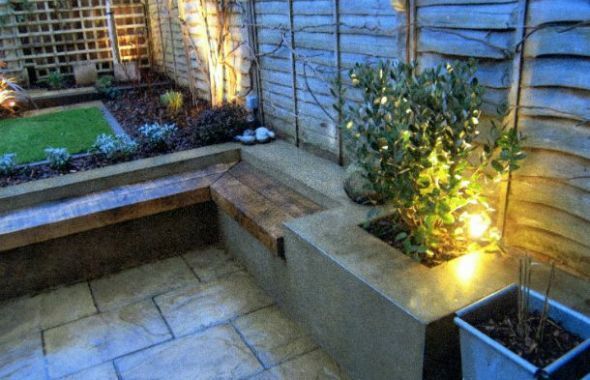 A wide terrace of grey sandstone paving created a generous seating area immediately outside the living room doors, edged with a border of black limestone setts. 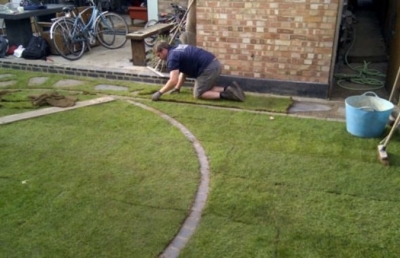 A step down leads to a large lawn, edged with a mowing strip of limestone setts, which are also used to create a circular motif in the lawn. 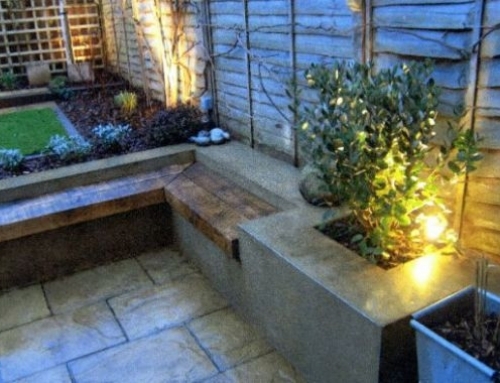 In the far left corner a landing of grey paving leads to a partly secluded are of slate crazy paving below a timber pergola from which a large hanging seat is suspended. 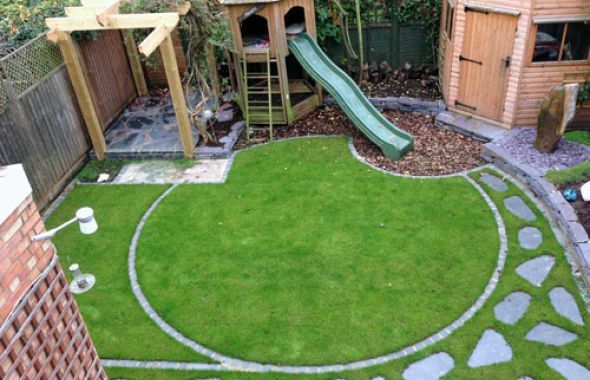 Large rounded slate stepping stones lead through the lawn around the house to the side gate and also out to the shed, saving wear on the lawn in bad weather. 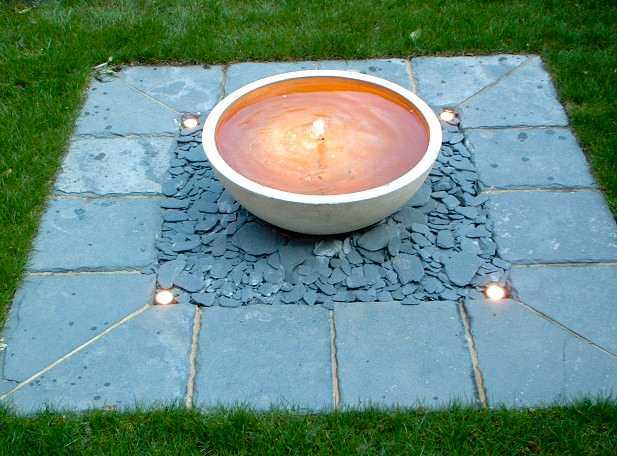 A large drilled slate standing stone has been used to create a water feature on the right of the garden, a strong a focal point visible from the inside the house. Water is pumped up from a reservoir hidden under the slate chipings base and bubbles gently out of the top of the stone before running down the face back into the reservoir. 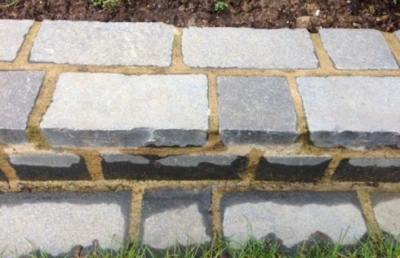 The water has already coloured the stone, helping it to blend into the garden. 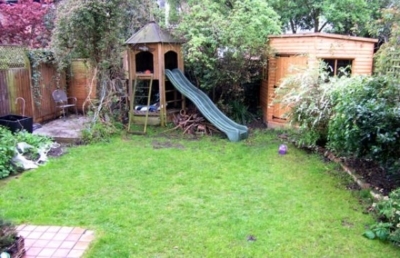 The play area below the slide is surfaced with bark chippings and low walls of Welsh slate retain the planting beds on the right and at the end of the garden. 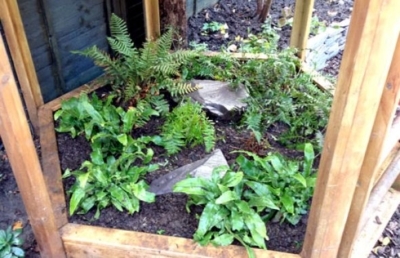 The base of the play house is planted up as a fernery, watered from above by a system of automatic spray nozzles. 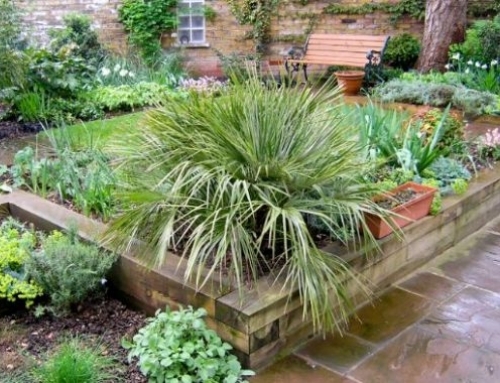 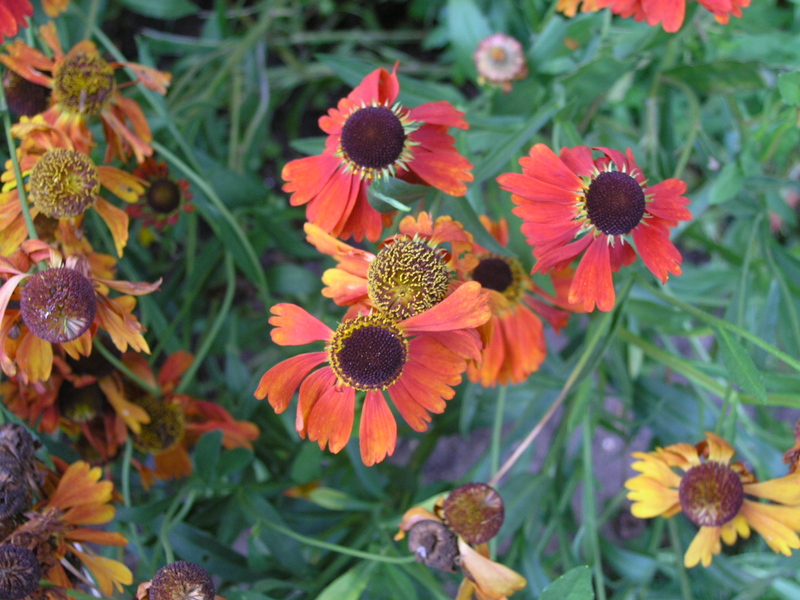 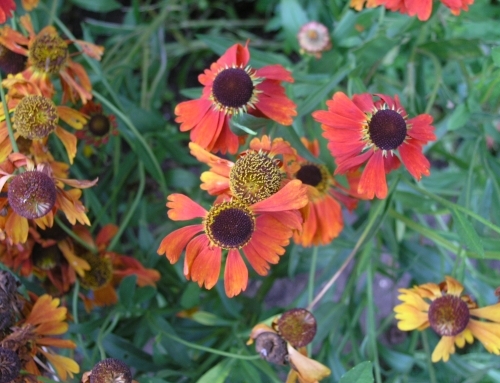 The planting is a key element of the garden and the beds are filled with a mix of evergreens for winter interest as well as flowering perennials, grasses and shrubs. 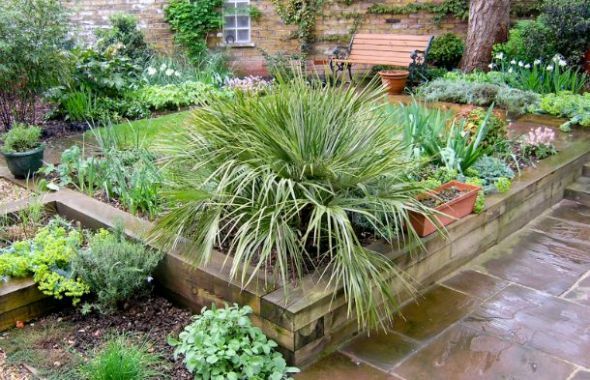 Plants include Rosemary, Euphorbia, Miscanthus grass, purple Salvia, blue Geranium, purple Heuchera, pink Hardy Geraniums and bronze Helenium. In the shady beds at the end of the garden there are ferns, Tiarella and autumn flowering white Japanese Anemones and pink Persicaria. 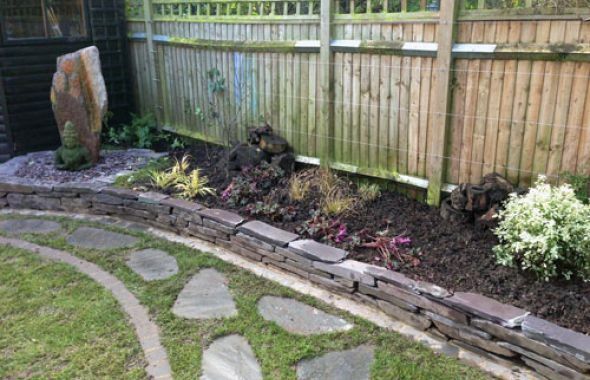 The fences are clothed with Honeysuckles, Clematis, Roses, white Passionfower, Star Jasmine and Chocolate Vine. 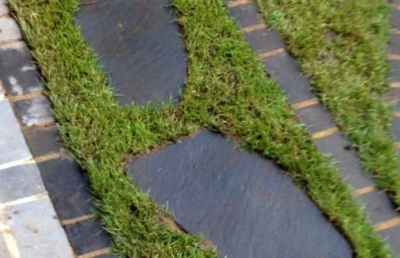 A Bloodgood Japanese Maple grows near the standing stone water feature, the base of which is covered with slate chippings. 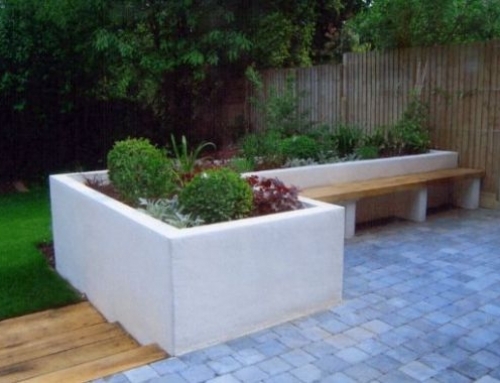 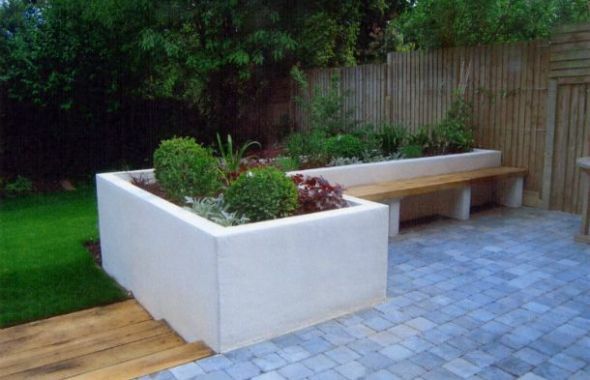 This garden successfully marries the contrasting needs of children and adults in a strong and unusual design where football pitch meets romantic arbour and play house meets lakeland planting.